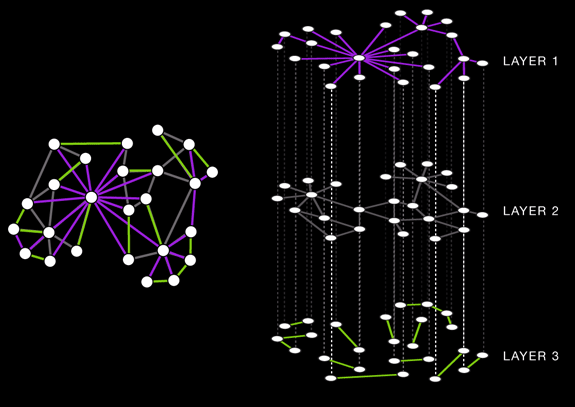 IE, given two gene network, I want to easily visualize which nodes are only in one of the two networks, which node's connectivity change, etc. Most papers I've seen on the subject describe algorithms to construct such networks, but I've yet to find an implementation of those. Hey Eric, do you mean network alignment? Maybe you want to try NetAligner, it is used for protein-protein interaction networks. If, as I guess, you want to go more general, then Cytoscape and some of its plugins (eg Graph Merge) are your friends. I have not gone deep into this, but look at this discussion. Cytoscape allows you to do all kind of network operations through its 'Merge Network' tool. If you work with networks and haven't checked Cytoscape out yet, then do it, it really is an invaluable tool.